FarSync XOT Runtime has been developed to provide high performance and very reliable XOT connectivity for Windows. 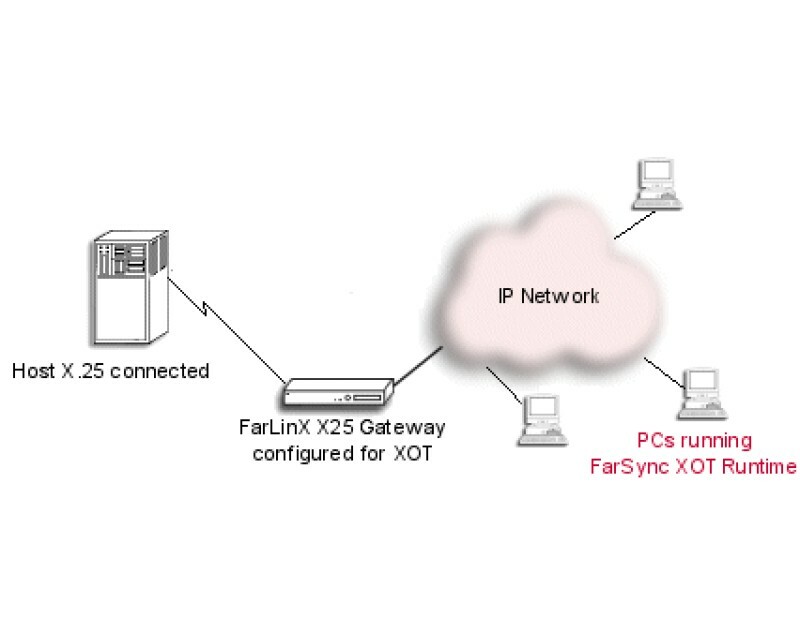 FarSync XOT Runtime for Windows inter-operates with the FarLinX X25 Gateway , FarSync XOT Runtime for Linux and other third party XOT devices, which can allow a complete X.25 network to be replaced by TCP/IP, eliminating hardware and costs just leaving a short X.25 connection to the host. The diagram above illustrates this. A comprehensive Developers Toolkit is included with the product. Sockets API. Applications written to use the Microsoft X.25 Sockets API, FarSync X.25 cards and some other commonly used X.25 cards will work with the FarSync XOT product without change. Both X.25 SVCs and PVCs are supported with a maximum of 4096 simultaneous connections. 32 and 64 bit systems are supported. For 64-bit applications support is planned for a future release.